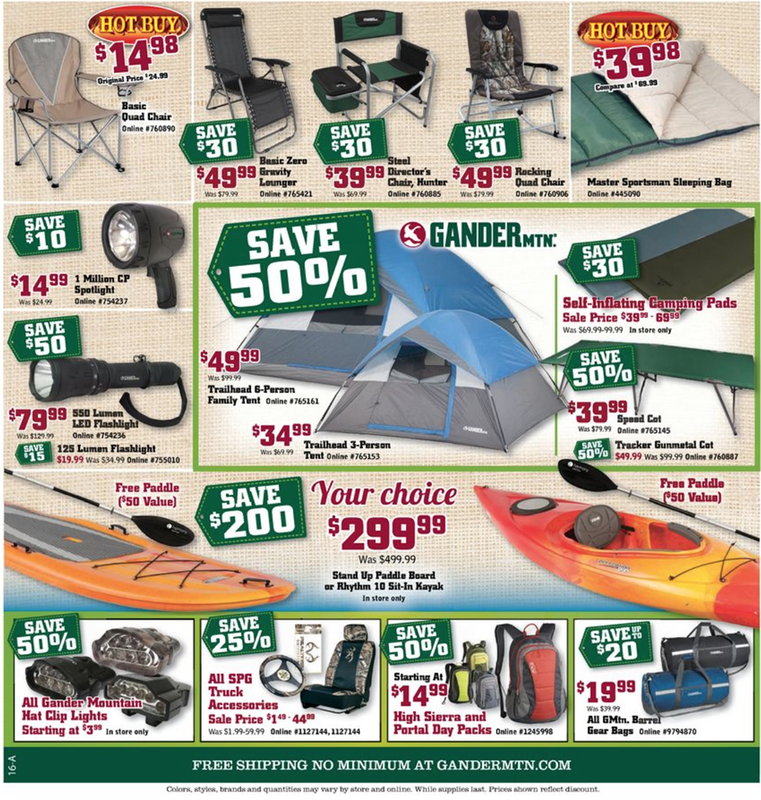 We still have a long ways to go until Gander’s Black Friday 2019 sale arrives. But you can scroll down the page to check out the details from their last Black Friday sale to get an idea of what’s likely to come. Enjoy! 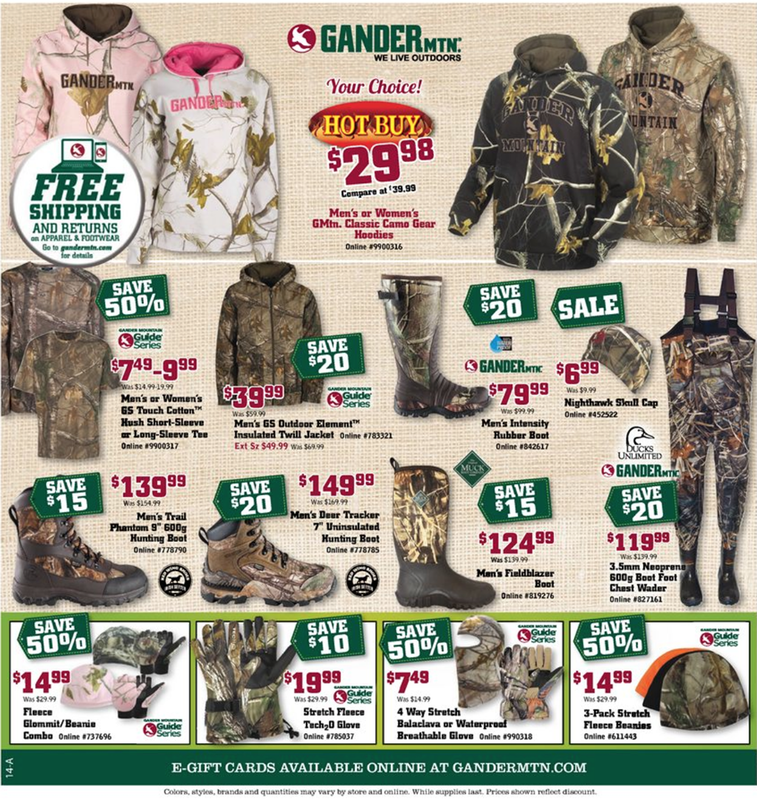 Updated on Friday, November 2, 2018: Gander Outdoors’ Black Friday ad has just arrived — We’ve posted all 31 pages (not counting that last page that’s mostly blank) down below so be sure to check it out! 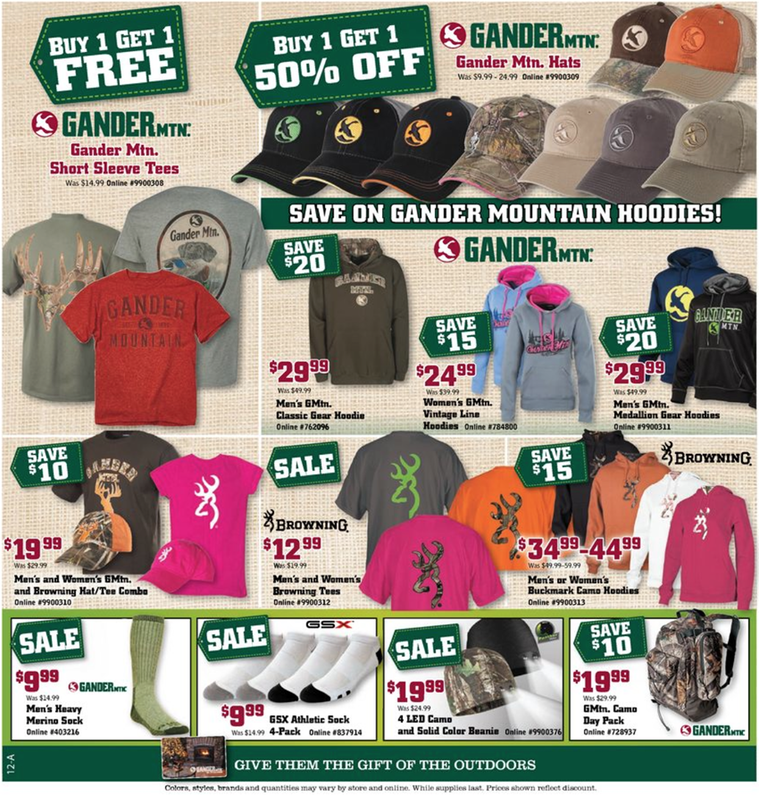 For details and to shop the sale visit ganderoutdoors.com from November 23–25th or your nearest Gander Outdoors store. Item may sell out early so be sure to shop early to catch the best bargains. Good luck! 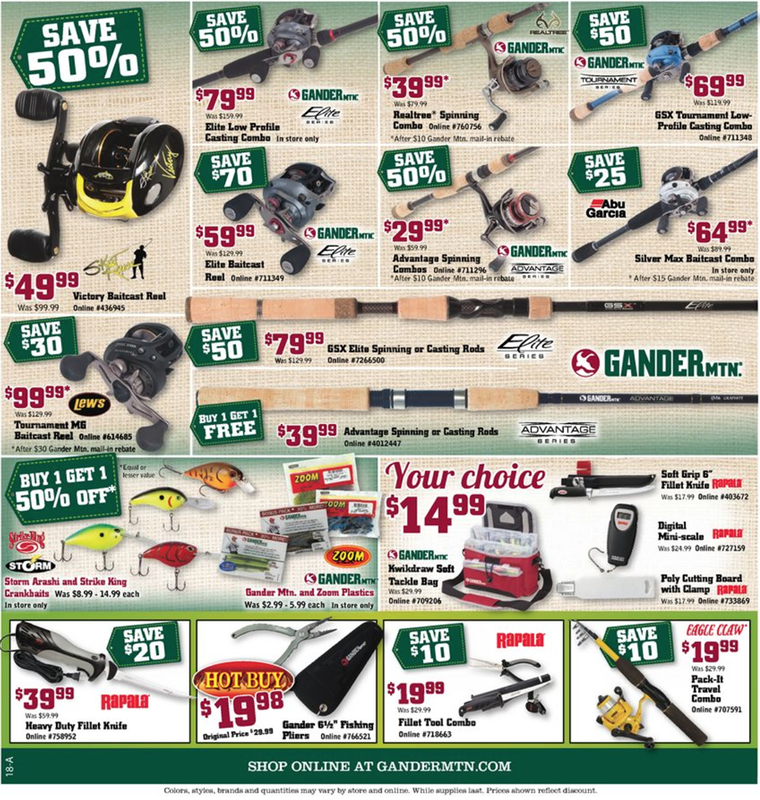 What new gear are you planning on picking up this year at Gander? Let us know in the comments (you’ll find the comments section located at the bottom of this page). 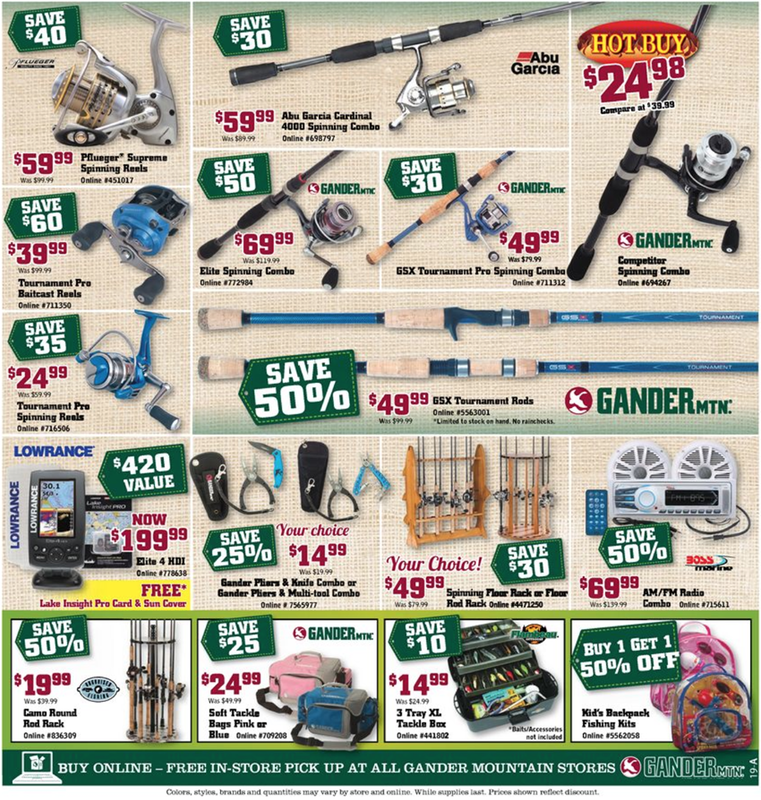 Updated November 20, 2016: If you don’t want to sleep in on Thanksgiving day or your wife just wants you out of the house as she prepares this year’s turkey feast, then you’ll be able to head on over to Gander Mtn. already from 8:00AM in the morning when stores open with their Black Friday sale. Of course you’ll still have the option of shopping on Friday in stores as well from from 5:00AM, or even easier, you can check out the same the deals online. 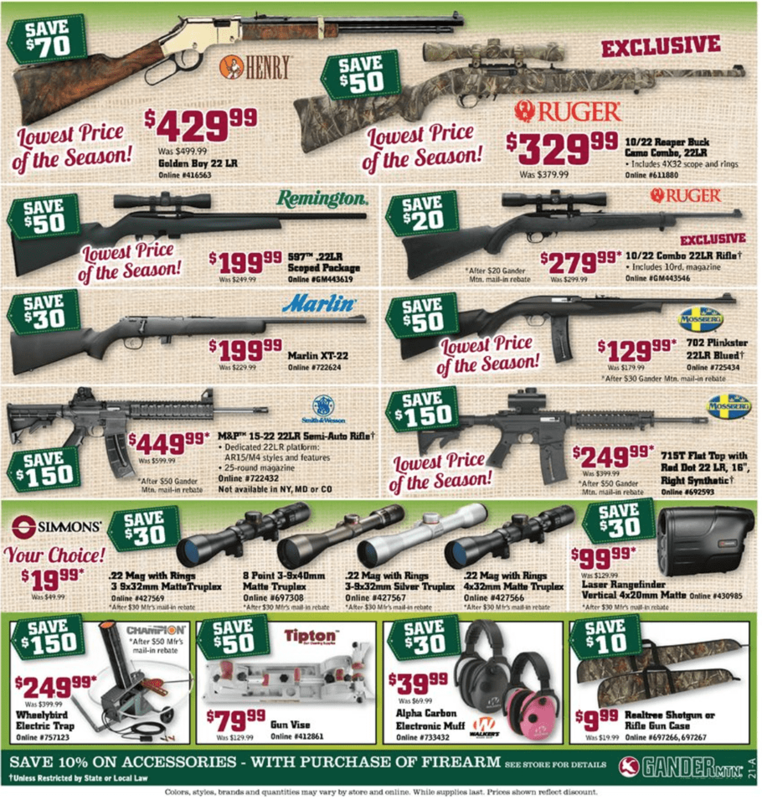 Guns, rifles and hunting equipment dominate this year’s Black Friday flyer (you can check it out in full down below!) with savings of up to $500.00. 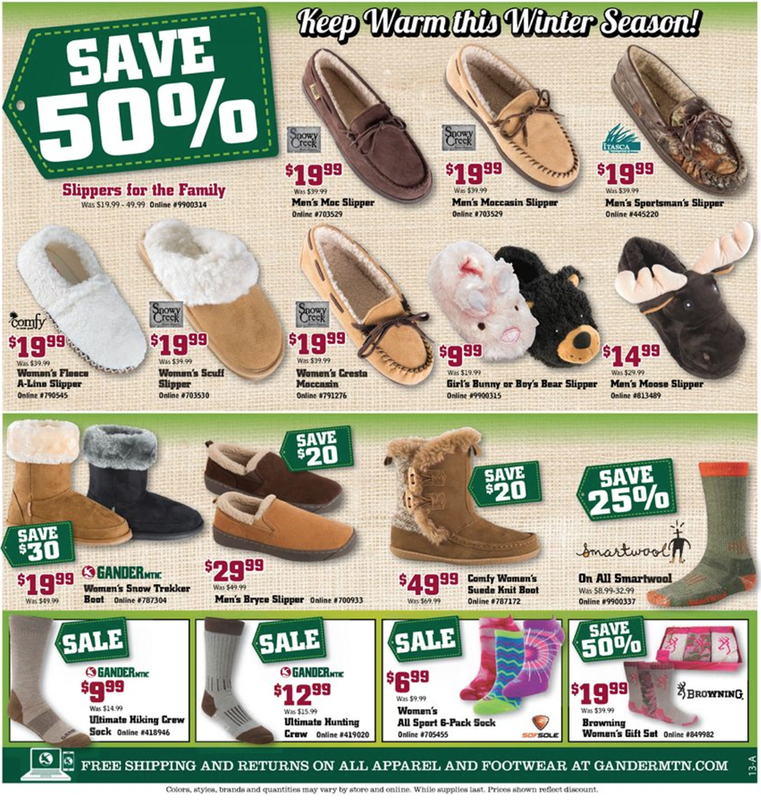 Besides that, there’s a number of 50% off items featured as their doorbuster deals. 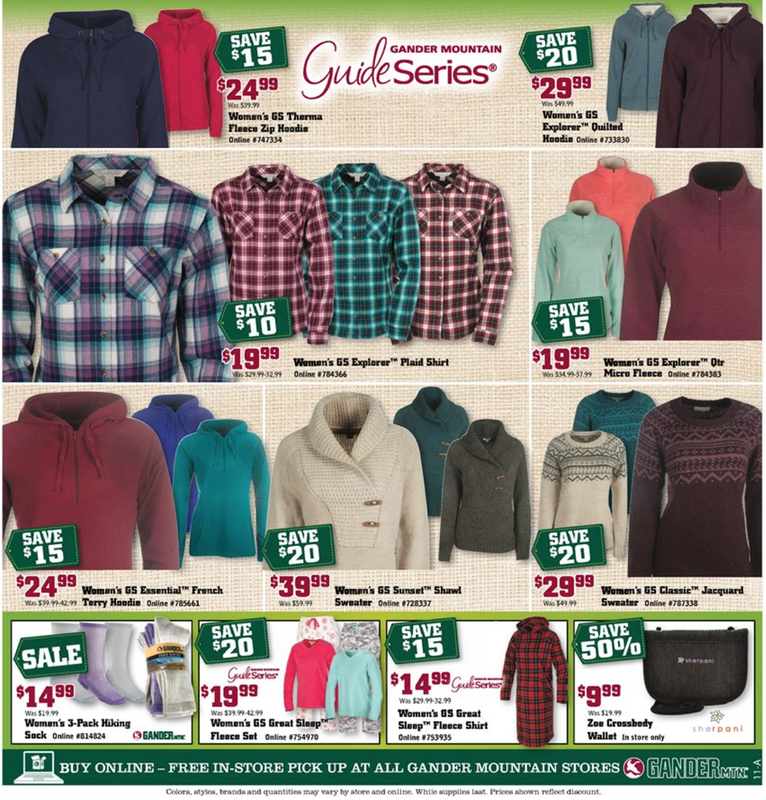 That includes the popular zero-gravity chair on sale from $34.99, shoes from $19.99 a pair, fleece 1/4 zips or hoodies from $12.99, and PJ’s from $9.99. Just remember that all of the featured deals in the ad are in very limited quantities and may sell out early. If you end up shopping online then you’ll be able to qualify for free shipping all through the holidays with no minimum purchase required. 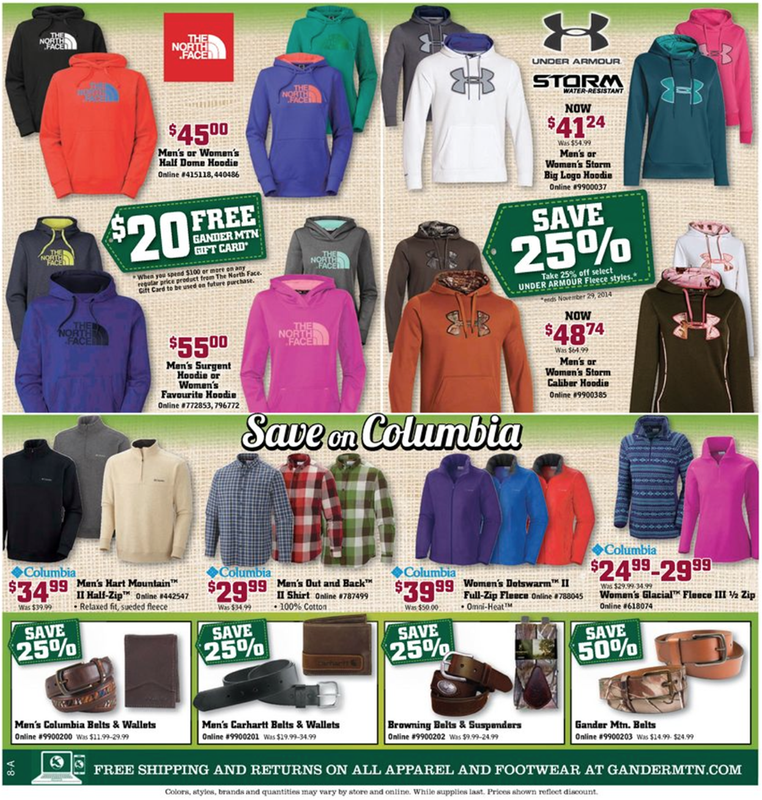 See their site for store for sale details and exclusions. Good luck! For many of us, there is nothing better in life than fishing and hunting. 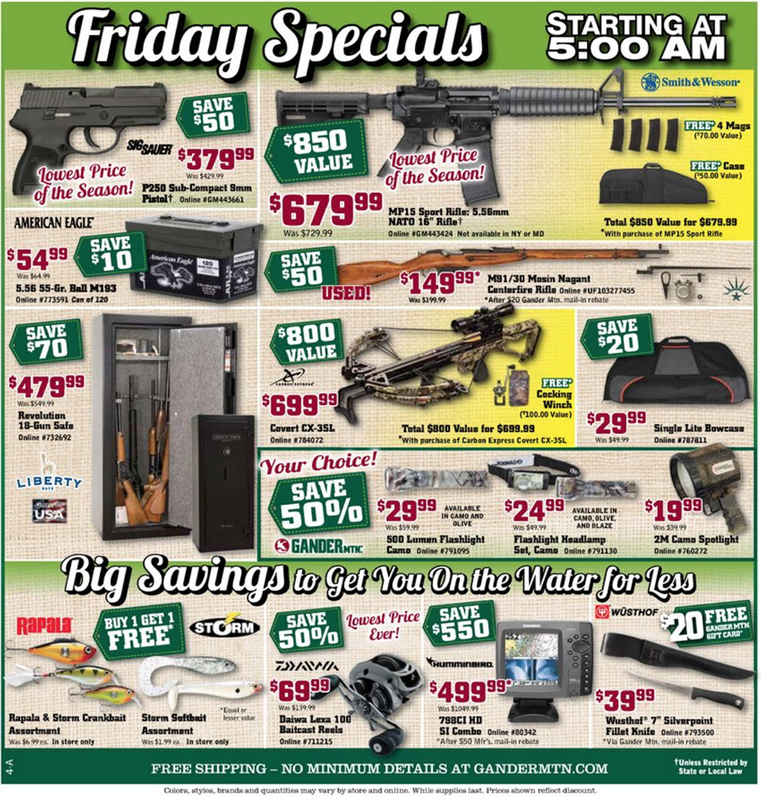 And even though you’re probably like me and don’t really enjoy shopping at the mall, especially with a ton of other people, you may want to reconsider as Gander Mountain’s Black Friday deals this year are pretty darn good. Starting on 5:00am on Friday, the first 100 people in line will have a chance to win some pretty cool prizes, including a limited edition Michelle 300 Spinning Reel and a GoPro camera. 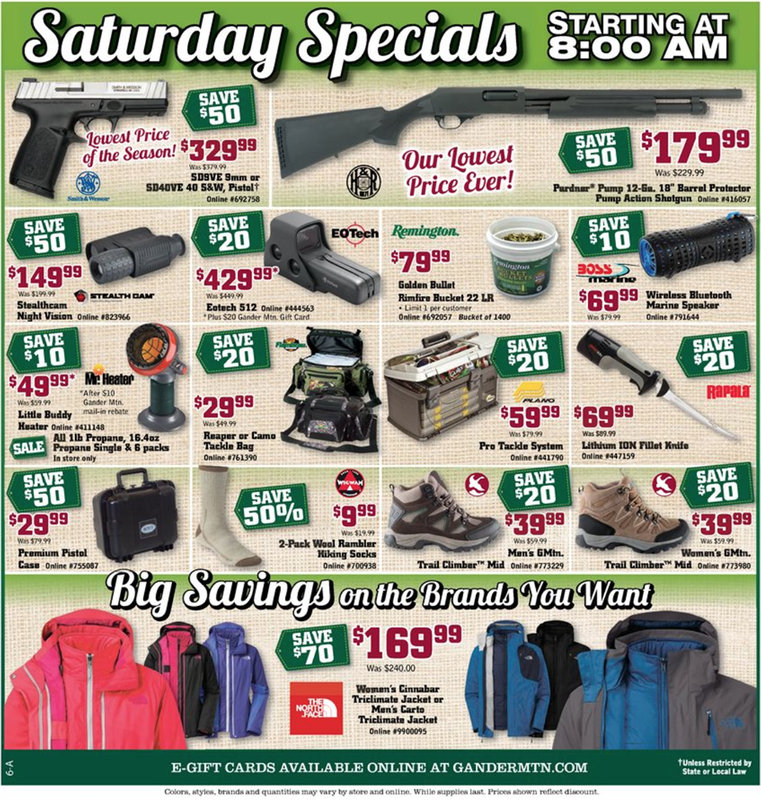 For the rest of you that can make it into the store in the morning on either Thanksgiving Day, Friday or Saturday, you’ll be able to score big with one of their door buster deals. 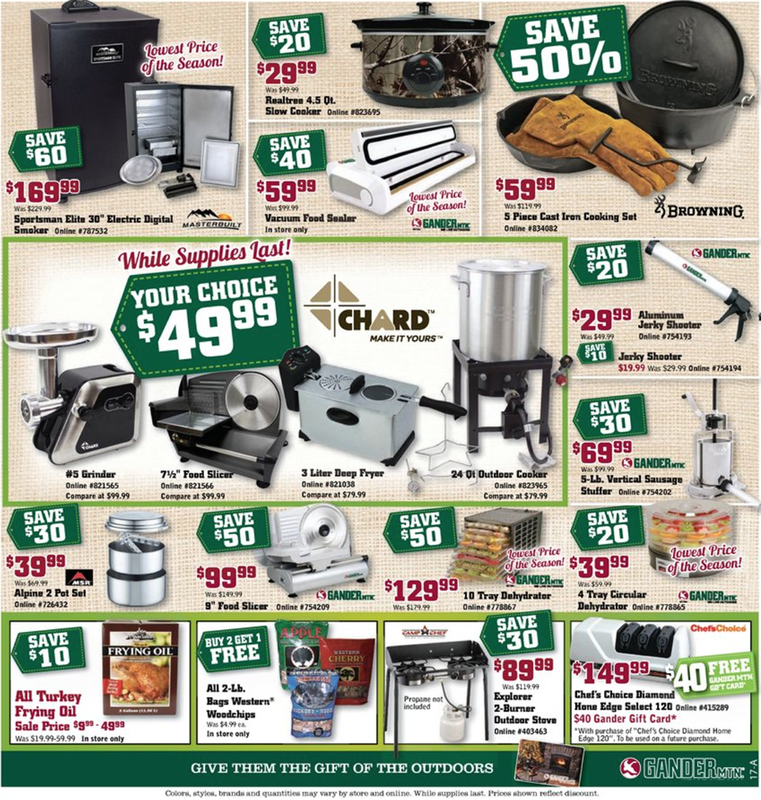 Each day the deals vary so be sure to see the full newspaper ad insert for details. 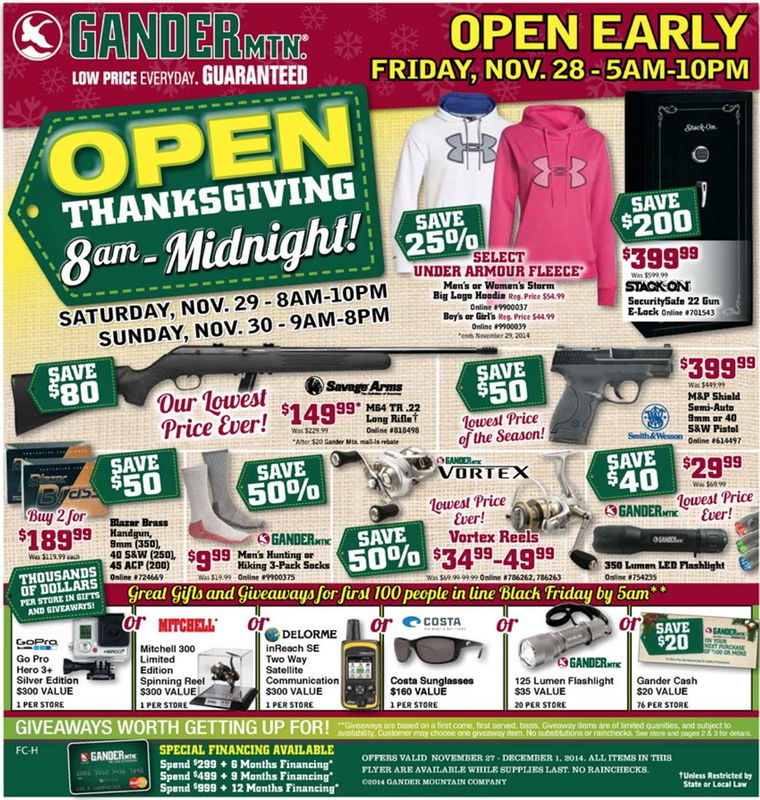 On Thursday, Gander Mountain is only one of a handful of stores that opens at 8:00am on Thanksgiving Day. And thats a good thing if you think about it as you can get your shopping in early and be back in time for lunch/dinner with the family. 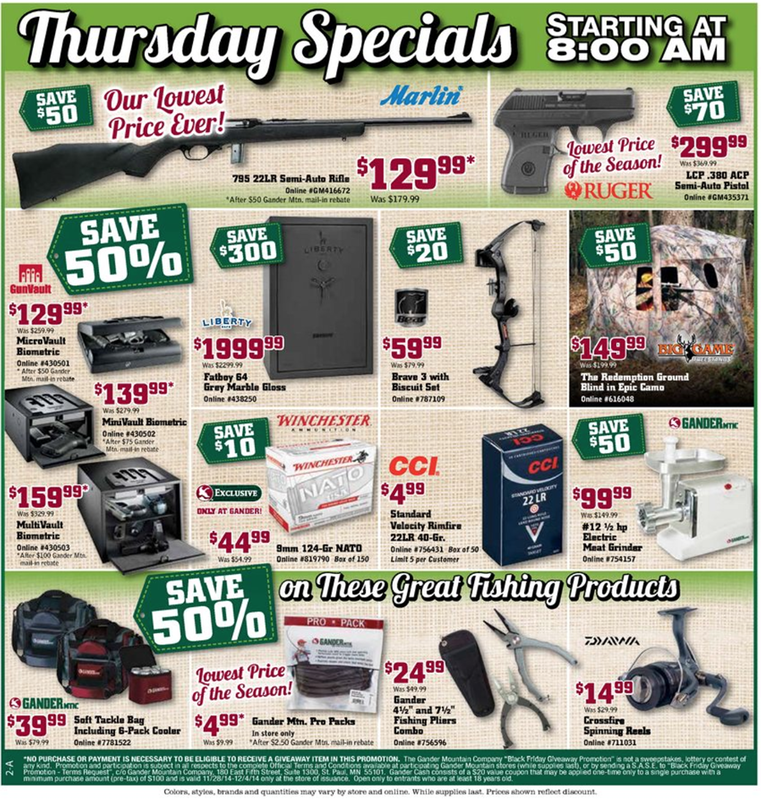 In terms of the Thursday deals, you’ll be able to pick up a Marlin semi-auto rifle for just $129.99 (less than an average pellet gun!). 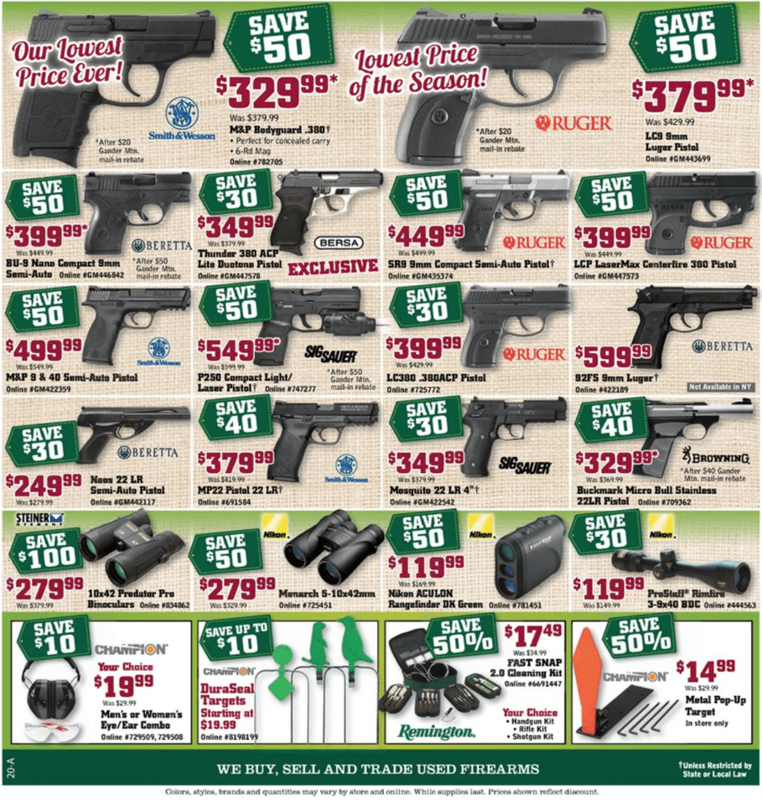 Or choose a Rugger LCP .380 ACP semiautomatic pistol for $299.99 which is their lowest price ever on this model. And if you don’t yet have one, don’t forget to pick up safe for your new gun. 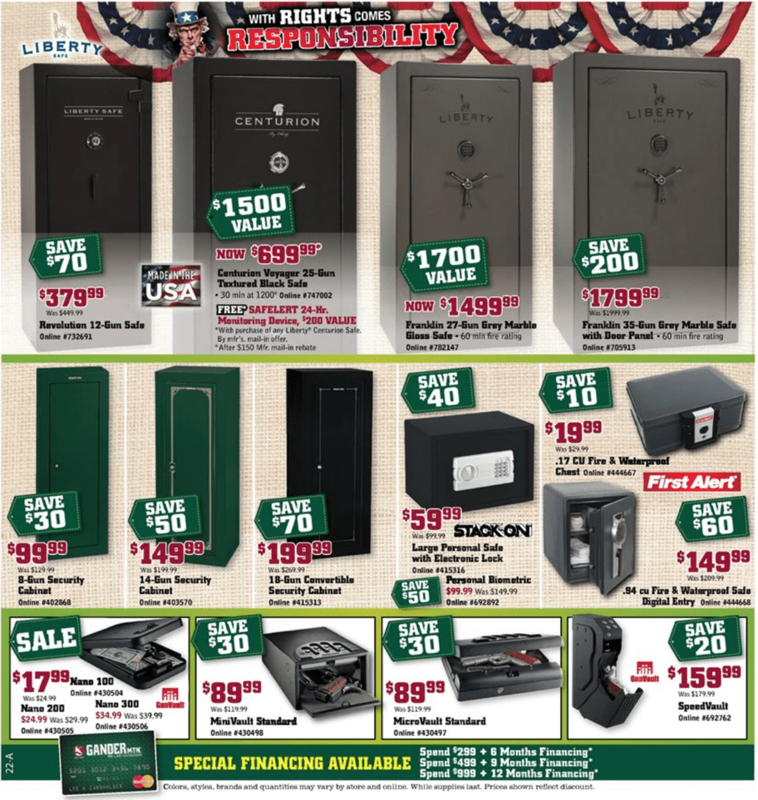 Gun vaults with biometric opening are on sale for as low as $129.99 (that’s 50% off the retail price). 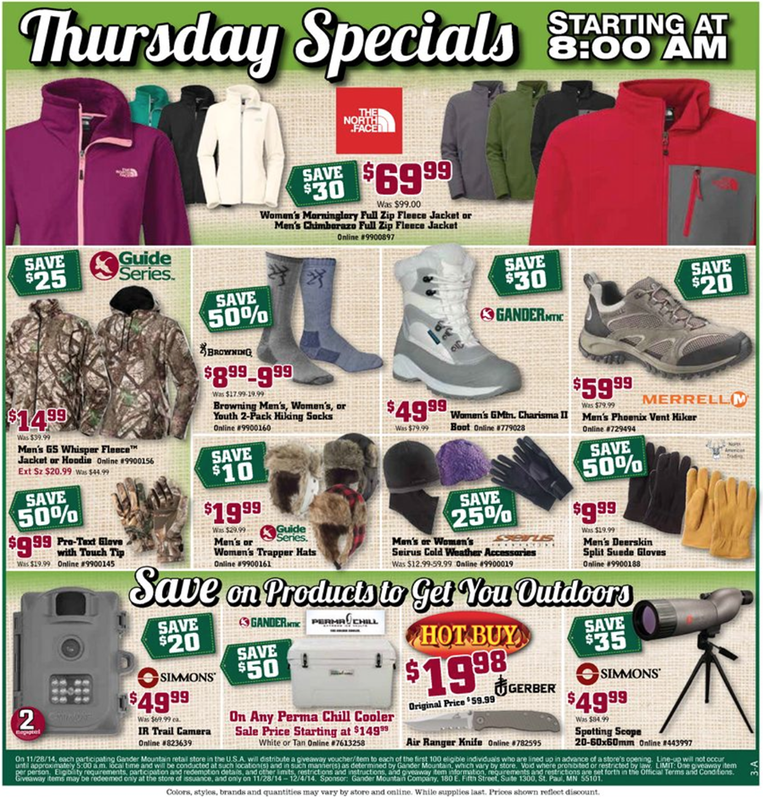 The Thursday deals also include one-a-year savings on clothing and shoes. 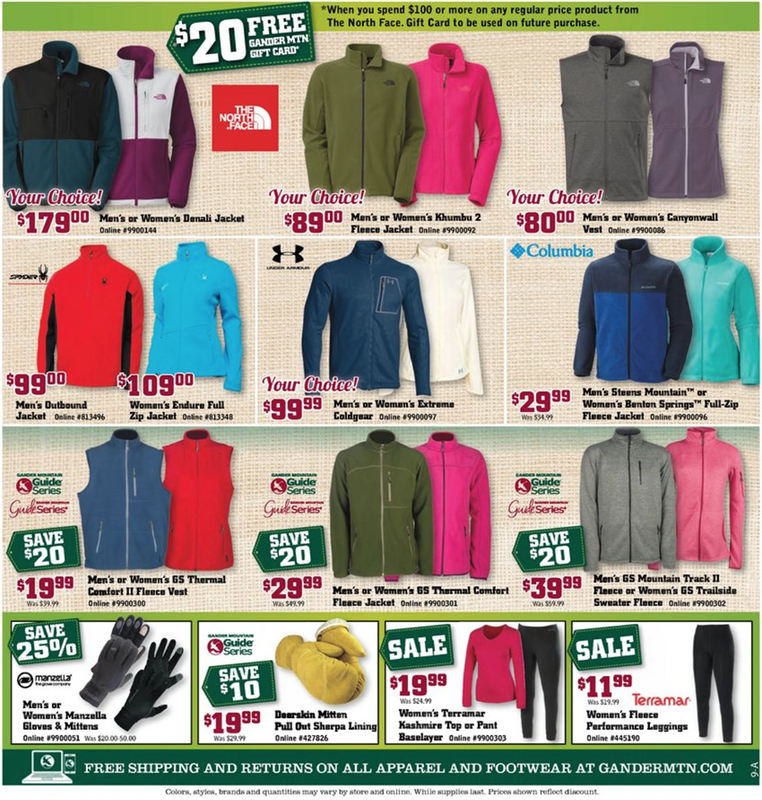 You’ll be able to save up to 33% on North Face fleece jackets for men and women, 50% on select GS Whisper fleece hoodies, and 50% on touch-tip gloves. 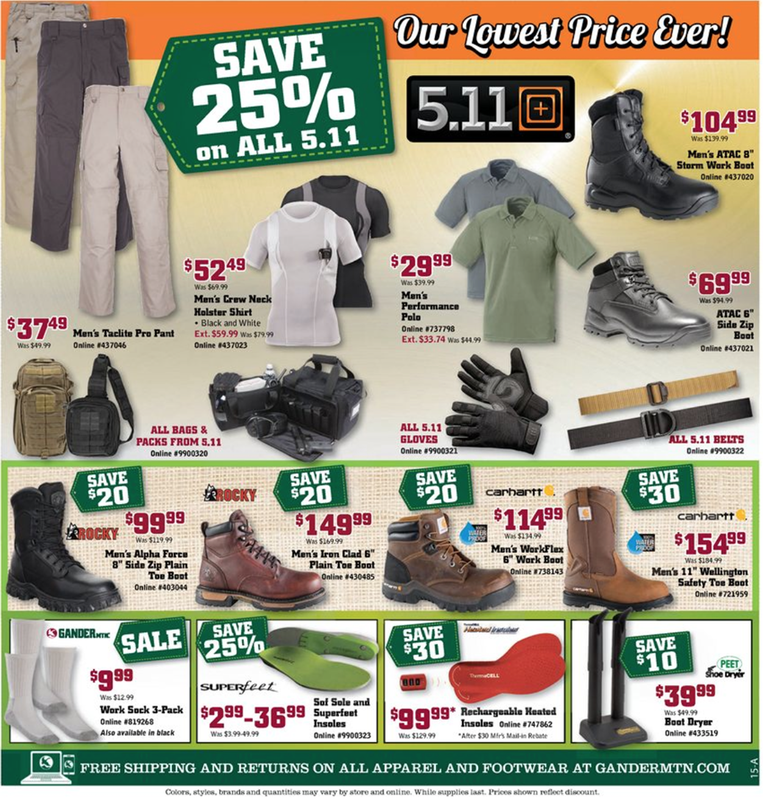 Don’t forget to check out the shoes – Our favorite are the Merrell Mens Phoenix Vent Hiker’s for just $59.99. 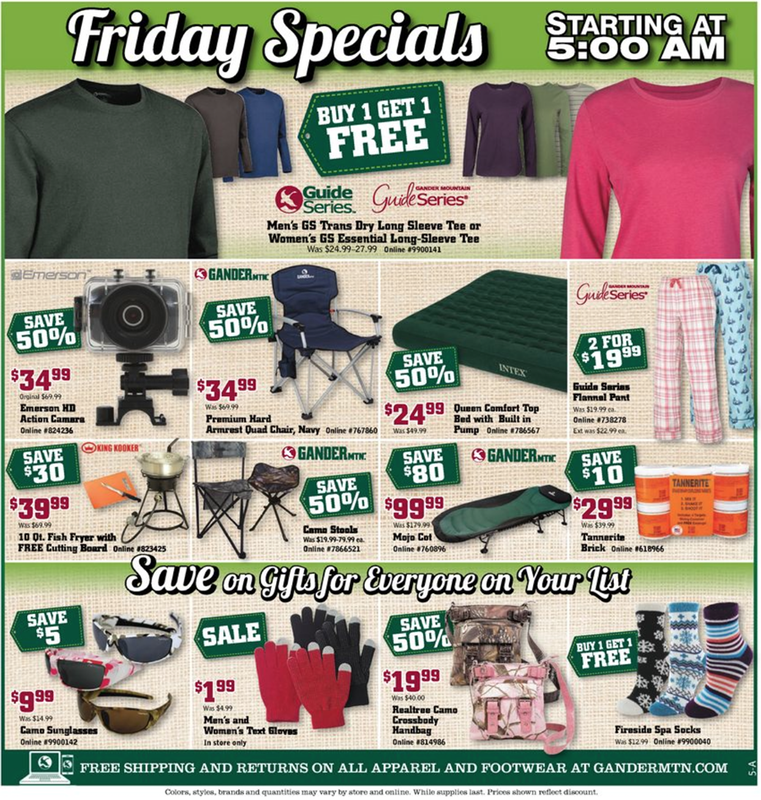 If you make it our to Gander Mountain on Friday morning, there this is when you’ll find the most deals in every department store-wide… From guns to fishing equipment, clothing to camping supplies. 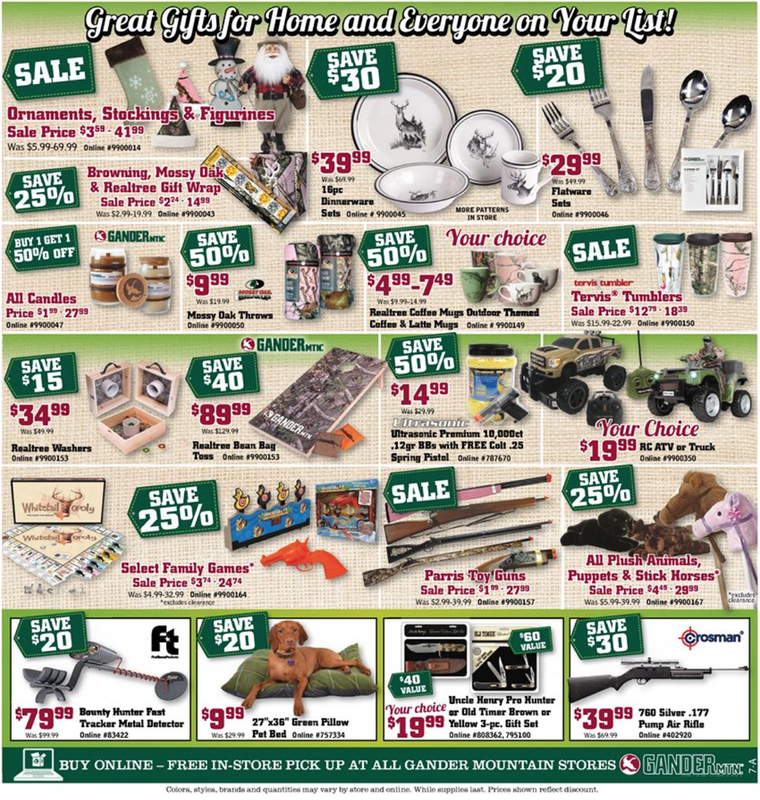 Many of the sale items extend to gandermtn.com (with free shipping available this weekend) so you’ll also be able to find may of the same stuff on sale as in-store. 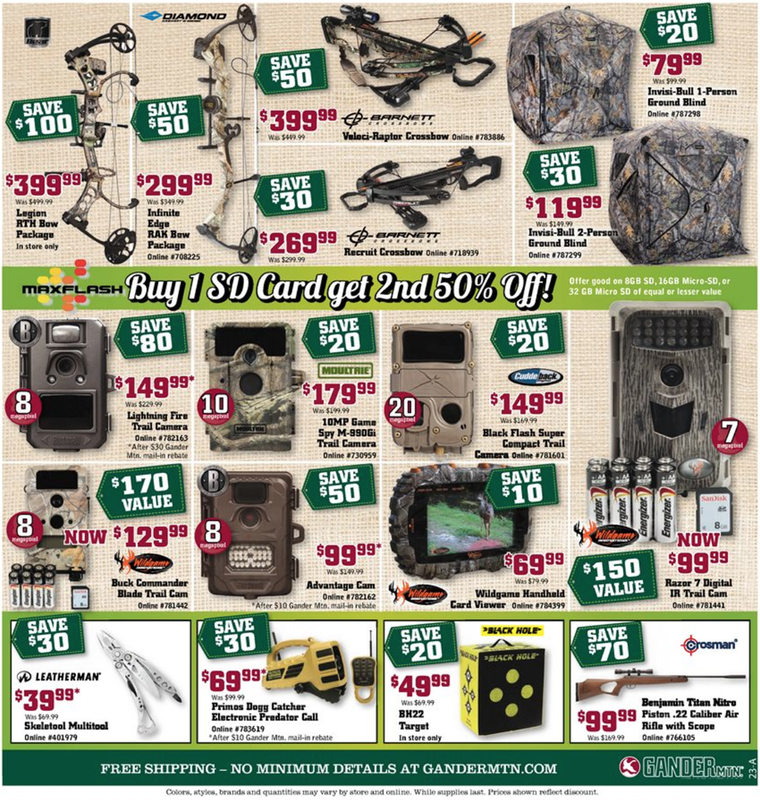 Gander Outdoors: Helpful Links & More! 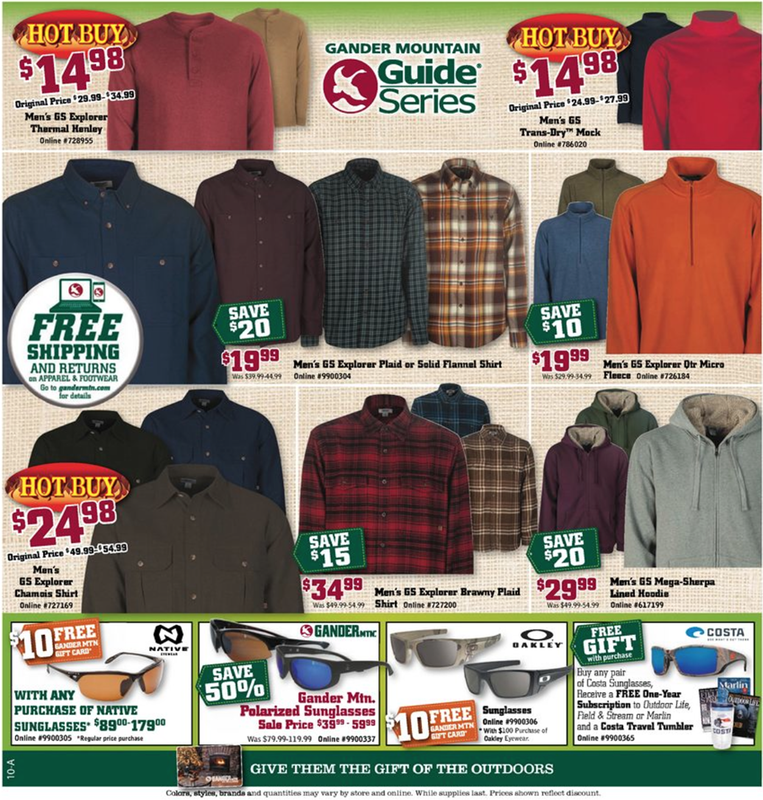 Find the nearest Gander Outdoors store in your neighborhood.